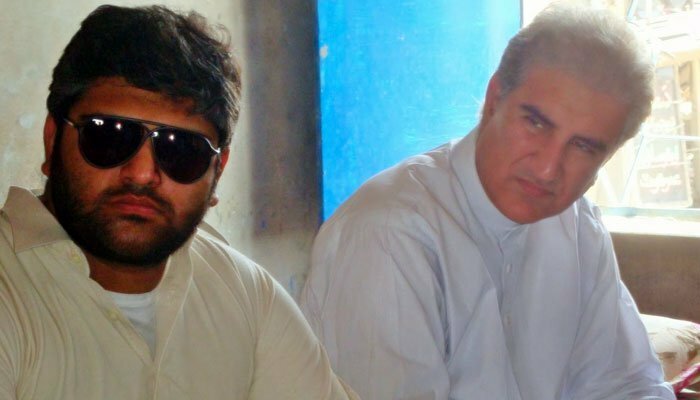 File photo of Shah Mehmood Qureshi with his son. Prime Minister Imran Khan has inducted 15 members of the National Assembly (MNA), including Foreign Minister Shah Mehmood Qureshi’s son and nephew, as parliamentary secretaries for various ministries and divisions. A notification issued by the Ministry of Parliamentary Affairs said that Qureshi’s son Makhdoom Zain Qureshi has been made Parliamentary Secretary on Finance while his nephew, Zahoor Hussain Qureshi, has been appointed Parliamentary Secretary on Energy. Of the others inducted, Lal Chand has been made Parliamentary Secretary on Human Rights, Rukhsana Naveed has been appointed Parliamentary Secretary on Climate Change, Rubina Jameel on Defence Production and Nausheen Hamid on National Health Sevices. Further, the premier has appointed Wajeeha Akram as Parliamentary Secretary on Education and Training, Shahdana Gulzar on commerce, Jameel Ahmed Khan on maritime affairs, Tahsqeen Haider on housing and works, Farrukh Habib on railway, Alia Hamza Mulk on textile, Raja Riaz Ahmed as Parliamentary Secretary on Petroleum and Andleeb Abbas as Parliamentary Secretary on Foreign Affairs.